Background: Heart failure is one of the leading causes of morbidity and mortality in the world. Mortality remains high (50%), despite optimal treatment according to the recommendations of the European Society of Cardiology (ESC) and Russian Society of Cardiology (RSC). Tremendous evidence has emerged over the past decades that heart failure is associated with inflammation. However, anti-inflammatory therapy widely lacks positive outcomes. Currently, there are no clinical studies investigating the molecular and cellular phenotypes of inflammation in myocardial tissue (viral, viral and autoimmune, and autoimmune types of inflammation) in patients with decompensated chronic heart failure (CHF). Therefore this study aims to develop a new medicinal drugs and approaches to treatment of decompensated CHF. Methods/Design: This open-label, nonrandomized, single-center, prospective trial includes decompensated CHF patients with ischemic systolic dysfunction (left ventricular ejection fraction < 40%) undergoing percutaneous coronary intervention (PCI)/coronary artery bypass graft (CABG) not earlier than 6 months before hospitalization. This group of patients will receive standard treatment of acute decompensated CHF according to RSC national guidelines and ESC guidelines. All patients will undergo coronary angiography to exclude ischemic etiology of decompensated CHF and endomyocardial biopsy to determine type of inflammation in the myocardium by immunohistochemistry. The following parameters are assessed during hospitalization and at 12-month follow-up: inflammatory infiltrate in the myocardial tissue, incidence of acute myocardial infarction, incidence of cardiac rhythm and conduction disturbances, left ventricular ejection fraction, end-diastolic and end-systolic volumes, mortality rate, incidence of stroke, and the rates of hospital admission due to the progression of CHF. Discussion: Elucidation of inflammatory infiltrate types in the myocardium and determination of frequency of their occurrences in patients with decompensated CHF and ischemic systolic dysfunction will contribute to the development of new pharmacological approaches to CHF treatment. Trial registration: ClinicalTrials.gov Identifier: NCT02649517; registered on January 5, 2016. Ethics: The study protocol follows the Declaration of Helsinki and has been approved by the Ethics Committee of the authors' institution on April 20, 2015. The study complies with the National Standard of Good Clinical Practice (RF GOST P52379-2005 form April 1, 2006) and with the international guidelines for Good Clinical Practice. Informed consent: Investigators or investigator-authorized officers will be responsible for explaining the objective, content, study procedures, benefits, and risks of participating in the clinical trial to each patient or the patient's legal representative. Written informed consent will be obtained from all patients before the start of the trial. Decompensated chronic heart failure (CHF) is a challenging medical and social problem of the modern society. The CHF prevalence rates are 7.9 million in Russia (Ageev and Ovchinnikov, 2013), 15 million in European countries, and 5.7 million people in the USA (Miró et al., 2016). Almost 80% of health care budget accrues to the treatment of heart failure (Teerlink et al., 2015). During the period from 1979 to 2000, studies have shown that treatment strategies, based on administration of angiotensin-converting enzyme inhibitors, beta-blockers, mineralocorticoid receptor antagonists, myocardial revascularization, and device therapy improve survival of patients with CHF (Batalov et al., 2014; Mozaffarian et al., 2016). In spite of that, the mortality rate remains high and nearly 50% of people with heart failure die within 5 years (Hobbs et al., 2007; Roger, 2013). Immune system plays an important role in the etiology and the course of CHF (Kharchenko, 2012). Acute decompensated CHF presents with increase in the cytokines which can lead to the left ventricular dysfunction, negative inotropic effect, cardiac metabolism alteration, myocardial remodeling, and progression of CHF (Briasoulis et al., 2016). Earlier, correlation relationship between the levels of pro-inflammatory biomarkers and high risk of mortality and readmission for acute decompensated CHF has been shown (Cowie et al., 2000). Unfortunately, the results of the experimental and exploratory clinical studies have not produced the effective anti-inflammatory strategy in CHF syndrome yet. Probably, conservative and invasive treatments of patients with decompensated CHF are not effective because of a combination of ischemic and inflammatory cardiomyopathy. Now the cardiomyopathy is a common cause of acute decompensated CHF (Pauly, 2014). Similarly to dilated cardiomyopathy (DCM), inflammatory cardiomyopathy (ICM), often leading to an unfavorable outcome, is difficult to treat so it has received increased attention recently (Gombozhapova et al., 2015). Virus-positive inflammation is a common reason for ICM. However, the autoimmune response also plays an important role in this pathology (Caforio et al., 2013). The most common viruses in the myocardium are enterovirus (Coxsackie virus), human herpes virus types 1 and 2, human herpes virus type 6, adenovirus, parvovirus B19, and Epstein-Barr virus (Noutsias et al., 2010; Rogovskaya et al., 2015). 60% of DCM cases present with ICM confirmed by using the polymerase chain reaction (Hofmann and Frantz, 2013). The Euroheart Failure Survey II showed that DCM is diagnosed in 11% of patients with CHF (Alaeva et al., 2012), and the five-year survival rate of these patients is 36%, which implies a poor prognosis in the significant proportion of patients with DCM, though medical treatment of CHF is given (Noutsias et al., 2010). Until now, there is no commonly accepted concept underlying diagnostics and treatment of ICM. In the available literature, there are no reports on exploration of the molecular and cellular phenotypes of myocardial inflammation (viral, viral and autoimmune, and autoimmune types of inflammation) in patients with decompensated CHF and ischemic cardiomyopathy. Based on these considerations, this study aims to develop a new treatment strategy for decompensated CHF. This study is an open-label, nonrandomized, single-center, prospective trial implemented at the Cardiology Research Institute, Tomsk NRMC, Russia. The study comprises decompensated CHF patients with ischemic cardiomyopathy (LVEF < 40%) who underwent PCI/CABG not earlier than 6 months before hospitalization. These patients receive standard treatment for acute decompensated CHF according to the national guidelines from the Russian Society of Cardiology as well as the guidelines from the European Society of Cardiology. 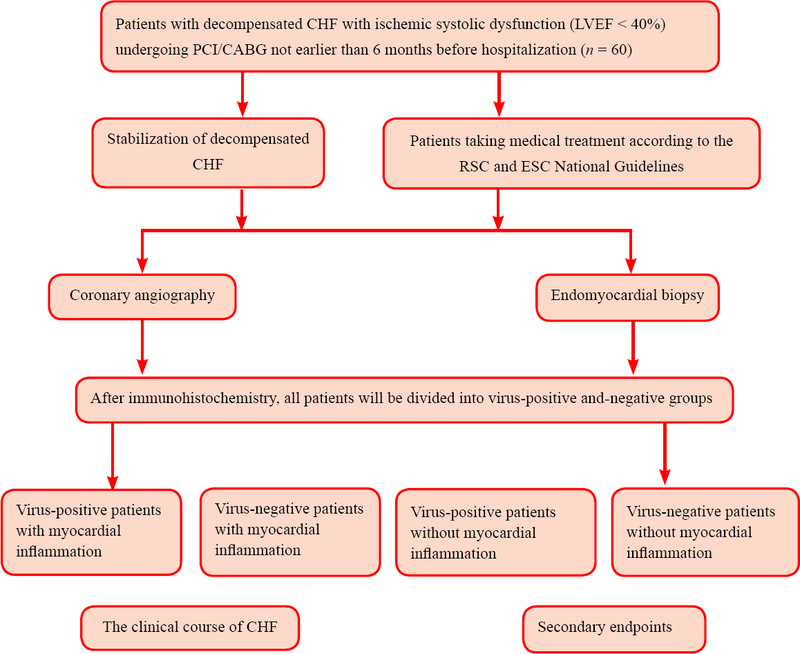 All patients undergo endomyocardial biopsy and coronary angiography to rule out ischemic etiology of decompensated CHF and are randomly divided into virus-positive and virus-negative groups according to the results of immunohistochemistry. After that, they are further divided into four subgroups: virus-negative patients with or without myocardial inflammation; virus-positive patients with or without myocardial inflammation ([Figure 1]). Figure 1: Flowchart of the trial. No sample size calculation was performed because this is a pilot study. A sample size of 60 patients seems sufficient. The following parameters are determined during hospitalization: rate of inflammatory infiltrate in the myocardial tissue; rate of virus-positive inflammatory infiltrate in the myocardial tissue; left ventricular ejection fraction; end-diastolic volume of the left ventricle; and end-systolic volume of the left ventricle according to echocardiography. The following parameters are determined at 12-month follow-up: rate of a certain type of inflammatory infiltrate in the myocardium; rate of virus-positive inflammatory infiltrate in the myocardial tissue; left ventricular ejection fraction; left ventricular end-diastolic volume; left ventricular end-systolic volume according to echocardiography; viruses present in the myocardial tissue; rate of acute myocardial infarction, rate of cardiac rhythm and conduction disturbances. The endomyocardial biopsy is usually performed through the femoral vein under fluoroscopic guidance using local anesthesia. During the procedure, three myocardial samples are harvested for immunohistochemistry analysis (Fiorelli et al., 2011). Immunohistochemistry of myocardial biopsies with mono- and polyclonal antibodies will allow for quantitative and qualitative characterization of the infiltrates in the presence/absence of viral antigens. Chronic myocardial inflammation is classified into the autoimmune, viral, and autoimmune-viral types. The criterion of viral inflammation consists in the presence of viral antigens in the myocardium (Rebenkova et al., 2015). Criterion for the autoimmune inflammation consists in the absence of viral antigens with/without serum antimyocardial autoantibodies. Autoimmune-viral inflammation requires the presence of viral antigens in the myocardium and the presence of serum antimyocardial autoantibodies (Caforio et al., 2013). Left ventricular ejection fraction, end-diastolic volume, and end-systolic volume will be assessed using echocardiography during hospitalization and at 12-month follow-up. Study parameters will be assessed during hospitalization and at 12-month follow-up. Outcome assessment is shown in [Table 1]. All data will be statistically analyzed using Statistica 10.0 software (Stat Soft Inc., Tulsa OK, USA). Data that are normally distributed are expressed as mean, standard deviation, minimum value, and maximum value. Data that are non-normally distributed are expressed as the lower (q1), median, and upper quartile (q3). Rates and frequencies of occurrence are expressed as percentages (%). Data are compared between groups using Student's t-test; nonparametric variables are compared between groups using the Friedman test, Kruskal-Wallis analysis of variance and Median Test. A value of P < 0.05 is considered statistically significant. Serum markers of inflammation in patients with decompensated CHF have been determined in previous studies (Kostenko et al., 2014; Goonewardena et al., 2016). Inflammatory serum markers were demonstrated to be increased in patients with ischemic heart disease (Naumov et al., 2013; Ryabov et al., 2013). An increasing number of studies have investigated the clinical efficacy of etanercept and infliximab, but no encouraging results regarding the outcomes in patients with CHF are obtained (Sychev and Mareev, 2009; Kovalev, 2011; Hofmann and Frantz, 2013). Discouraging results have raised important questions on the significance of the inflammatory activation in CHF. Meanwhile, basic and translational clinical studies accumulated a lot of novel mechanistic information suggesting that inflammatory cells may represent new promising targets for therapy (Hofmann and Frantz, 2013). However, until now, an effective anti-inflammatory therapy has not been established for patients with CHF. This study is unique as it elucidates types of inflammation and frequencies of their occurrences in the myocardium in association with clinical-morphological course of CHF. New data generated in this study may be helpful for the development of new drugs and approaches to treatment of CHF. Ageev FT, Ovchinnikov AG (2013) The new guidelines for the diagnosis of heart failure with preserved left ventricular ejection fraction (diastolic heart failure). Heart Fail 5: 97-300. Alaeva EN, Narusov OIu, Safiulina AA, Shchedrina AIu, Skvortsov AA, Tereshchenko SN (2012) Epidemiology of dilation cardiomyopathy. Kardiologiia 52:56-61. Batalov RE, Rogovskaya YV, Ryabov VV, Tatar RB, Sazonov SI Hlynina MS, Popov SV, Karpov RS (2014) Idiopathic atrial fibrillation, inflammation and clinical results of radiofrequency ablation. J Cardiol 12:7-12. Briasoulis A, Androulakis E, Christophides T, Tousoulis D (2016) The role of inflammation and cell death in the pathogenesis, progression and treatment of heart failure. Heart Fail Rev 21:169-176. Caforio AL, Marcolongo R, Jahns R, Fu M, Felix SB, Iliceto S (2013) Immune-mediated and autoimmune myocarditis: clinical presentation, diagnosis and management. Heart Fail Rev 18:715-732. Cowie MR, Wood DA, Coats AJ, Thompson SG, Suresh V, Poole-Wilson PA, Sutton GC (2000) Survival of patients with a new diagnosis of heart failure: a population based study. Heart 83:505-510. Fiorelli AI, Groppostolf NA, Groppostolf WM (2011) Endomyocardial Biopsy Guided by Echocardiography. INTECH Open Access Publisher. Gombozhapova AE, Rogovskaya YuV, Ryabova TR, Kruchinkina EV, Gunderina KI, Batalov RE, Ryabov VV (2015) A clinical case of pseudocoronary scenario of inflammatory cardiomyopathy. Siberian Med J 4:61-65. Goonewardena SN, Stein AB, Tsuchida RE, Rattan R, Shah D, Hummel SL (2016) Monocyte subsets and inflammatory cytokines in acute decompensated heart failure. J Card Fail 22:358-365. Hobbs FD, Roalfe AK, Davis RC, Davies MK, Hare R; Midlands Research Practices Consortium (MidReC) (2007) Prognosis of all-cause heart failure and borderline left ventricular systolic dysfunction: 5 year mortality follow-up of the Echocardiographic Heart of England Screening Study (ECHOES). Eur Heart J 28:1128-1134. Hofmann U, Frantz S (2013) How can we cure a heart ′′in flame′′? A translational view on inflammation in heart failure. Basic Res Cardiol 4:2-19. Kharchenko EP (2012) Heart failure: pathogenetic continuum and biomarkers. Cardiology 3:53-64. Kostenko VA, Ariskina OB, Osipova IV, Pivovarova LP, Skorodumova EA, Soroka VV, Fedorov AN, Kiselgof OG (2014) Elements of systemic inflammatory response and clinical implications in patients with decompensated chronic heart failure. Siberian Med J 3:37-40. Kovalev OH (2011) Correction of cytokine aggression in heart failure: theoretical background and practical realities. Heart Fail 2:93-100. Miró Ò, Peacock FW, McMurray JJ, Bueno H, Christ M, Maisel AS, Cullen L, Cowie MR, Di Somma S, Martín Sánchez FJ, Platz E, Masip J, Zeymer U, Vrints C, Price S, Mebazaa A, Mueller C; Acute Heart Failure Study Group of the ESC Acute Cardiovascular Care Association (2016) European Society of Cardiology - Acute Cardiovascular Care Association position paper on safe discharge of acute heart failure patients from the emergency department. Eur Heart J Acute Cardiovasc Care pii: 2048872616633853. Mozaffarian D, Benjamin EJ, Go AS, Arnett DK, Blaha MJ, Cushman M, Das SR, de Ferranti S, Després JP, Fullerton HJ, Howard VJ, Huffman MD, Isasi CR, Jiménez MC, Judd SE, Kissela BM, Lichtman JH, Lisabeth LD, Liu S, Mackey RH, et al. (2016) Heart Disease and Stroke Statistics-2016 Update. A Report From the American Heart Association. Circulation 133:e38-360. Naumov VG, Sumarokov AB, Ezhov MV, Aleksandrova EN, Novikov AA, Raimbekova IR, Samko AN, Masenko VP (2005) Markers of chronic inflammation in patients with ischemic heart disease with in-stent restenosis. Kardiologiia 45:14-17. Noutsias M, Schultheiss H, Kühl U (2010) Immunohistological diagnosis of inflammatory cardiomyopathy and diagnosis of cardiotropic viral infections. Inflammatory Cardiomyopathy (DCMi) Pathogenesis and Therapy. Springer Basel AG 4:201-205. Pauly DF (2014) Managing acute decompensated heart failure. Cardiol Clin 32:145-149, ix. Rebenkova M, Gombozhapova A, Shurupov V, Rogovskaya Y, Botalov R, Ryabov V, Popov S, Karpov R (2015) The role of viruses, inflammation and myocardial macrophages in the development of idiopathic arrhythmia//NEW OPERATIONAL TECHNOLOGIES (NEWOT′2015): Proceedings of the 5th International Scientific Conference «New Operational Technologies». AIP Publishing 1688:030024. Roger VL (2013) Epidemiology of heart failure. Circ Res 113:646-659. Rogovskaya Y, Botalov R, Ryabov V (2015) Histopathologic, immunohistochemical features and profile of viral antigens in patients with myocarditis. Adv Mat Res 1085:447-452. Ryabov V, Suslova T, Shurupov V, et al. (2013) Levels of Galectin-3, BNP and NT-pro BNP in 1 year after STEMI in patients with preserved LVEF. Eur J Heart Fail 12:S214. Sychev AV, Mareev VI (2009) Anticytokine therapy in the treatment of patients with chronic heart failure. Kardiologiia 50:77-83. Teerlink JR, Alburikan K, Metra M, Rodgers JE (2015) Acute decompensated heart failure update. Curr Cardiol Rev 11:53-62. VVR and EVK conceived and designed the study, acquired data, and drafted the manuscript. All other authors acquired data and made substantial contributions and revisions to the manuscript.TRR performed echocardiography examinations. REB, YVR, and MSR identified cell-morphological composition of infiltration in the myocardium. SVP and RSK participated in critical review of the manuscript. All authors have read and approved the final manuscript.